Our lollipop soap favors are a sweet choice for your special event favors! 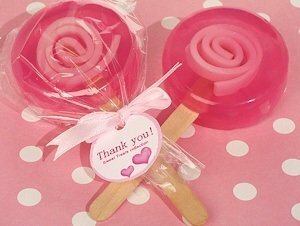 Each round soap favor resembles a pink lollipop with a white swirl center and is attached to a stick then wrapped in clear cellophane. Each pink party favor lollipop soap is finished with a pink satin bow and a "sweet treat" thank you tag. Measures 2.5" x 6" long.